Vertical gardening is quickly becoming one of the most popular methods for maximizing the space within a greenhouse. Vertical gardening is exactly what it sounds like: gardening in vertical rows instead of horizontally. In other words, the plants are, in various configurations, stacked one on top of another. For greenhouse horticulturists, vertical gardening opens up the possibility of filling the greenhouse from the bottom to the top with foliage. There are many different ways a greenhouse horticulturist can utilize vertical gardening techniques, but shelving, vertical planters, and vertical hydroponic systems are the most popular methods. Believe it or not, greenhouse shelving is a form of vertical gardening. The shelving used in a greenhouse allows a gardener to stack plants on top of each other and better utilize the given floor space. 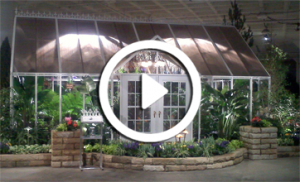 There are many different ways greenhouse shelving can be set up in a greenhouse. Generally speaking, the shelving should be set up in multiple tiers with the highest tier on the wall that is opposite the side of the greenhouse that receives the most light. By doing this, the plants on the higher shelving will not shade out the other plants located lower in the garden. Vertical planters are either manufactured or homemade planting structures designed to house plants in a vertical manner. An example of a vertical planter is the GreenStalk planter shown here, which holds 24 plants in a 2′ x 2′ area. Vertical planters are usually designed to be used with potting soil. Typically, these planters are watered from the top, allowing gravity to bring the moisture to all of the plants in the container. Strawberries and lettuce are two crops commonly grown in vertical planters with great success. 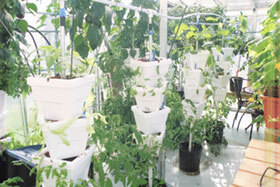 Vertical hydroponic systems are systems that utilize soilless gardening in a vertical position. Most vertical hydroponic systems are recirculating systems, which means the nutrient solution is collected and reused after each feeding. The nutrient solution is commonly delivered to the upper most plant module so gravity can bring the solution to the remaining plants down below. 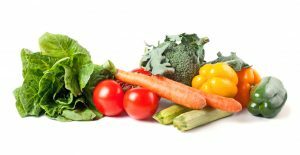 Vertical hydroponic systems combine the speed of growth associated with hydroponic gardening and the space maximizing benefits of vertical gardening. There are a few things to consider when setting up a vertical garden. One big consideration is shading out other plants in the greenhouse. The tallest vertical system should be placed on the opposite side of the prevailing light. 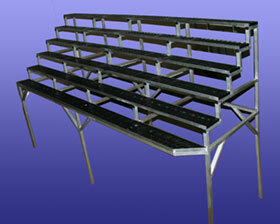 The best way to visualize an appropriate vertical garden in a greenhouse is to think of it as stadium seating. In other words, the plants are staggered from shortest to tallest so that the plants can receive the most sunlight possible. Another big consideration for vertical systems is nutrient consistency. This is most important in vertical hydroponic systems where the nutrient solution will be reused. Daily monitoring of nutrient and pH levels in a vertical hydroponic system is an absolute must. If constructing a homemade vertical system, make sure to take into account the additional weight of the plants and soil or medium. If a vertical system is extremely top heavy, it may need additional safety supports to prevent it from tipping or falling. Trying a vertical gardening technique is a fun way for a greenhouse hobbyist to experiment with maximizing his or her given garden floor space. Experimenting with vertical gardening can be as simple as trying different shelving configurations or as advanced as an automated vertical hydroponic system. Vertical gardens allow greenhouse hobbyists to better utilize the space within a greenhouse by literally having plants from the floor to the roof. When the garden space is better utilized, more plants can be grown, which is good news for any greenhouse enthusiast.